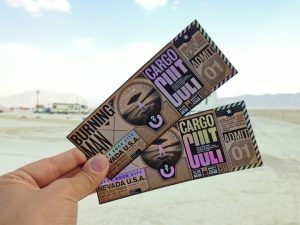 Despite the notoriety of Burning Man as being a place where people can be their naked selves, still most participants wear some type of clothing most of the time. This then begins the conversation as to what should you wear to facilitate comfort and self-expression out on the playa. Here’s a few ideas for Burning Man ensembles to spark your creativity. Desert temperatures are never trustworthy, especially the high deserts of Nevada. This means it would behoove the burner to be equipped not only for warm weather, but also for cold weather: especially when that sun sets. Keep a jacket on the packing list. The idea of cold weather in a desert may be shocking, but warm weather is probably expected. It is common for temperatures to be over a hundred degrees during the day in Black Rock City. This means dressing in a way to stay cool. Being naked is, strangely, not the best way to combat desert heat, but if that’s the path you plan to take, be sure to bring ample sunscreen to cover all of you. Those places that don’t usually see the sun are always at a high risk of burning. If you’re looking for clothes that will keep you cool, think light woven acrylics or wool. This will wick the sweat away from your body. Not only will you be dry, but, as the sweat dries, you’ll stay cool. Sand storms are a common occurrence in the Nevada desert. Just take a drive across I-80 or I-15 and you’ll see tall pillars of sand being whipped around by whirlwinds. As a resident of Black Rock City you’ll want to be prepared for these dust storms. Having a neckerchief or scarf draped around your neck will give you something to keep the dust out of your mouth and nose. Nobody likes a sand dinner. It’s nice to have a set of goggles to keep the sand out of your eyes. Sunglasses will not cut it when that wind gets to whipping. View Our Top 10 Goggle Recommendations. There are no essential costumes for Burning Man, but there are a few guidelines to remember. Whenever you spend time in an undeveloped wilderness, you are a visitor, which means it’s essential to practice leave-no-trace. Burning Man takes this so seriously they’ve come up with an acronym for liter—MOOP or Matter Out of Place. Because of this, you should make sure that your costume doesn’t include feathers, glitter, or sequins. All these items tend to find their way off the costume and into the playa sand as MOOP, which makes for difficult clean-up. Aside from these small guidelines there are no boundaries for costuming. It’s always nice if you can put a little of your own work into the construction, so your clothing becomes your own work of art. Some people go as far as to paint their bodies. Others opt for bright colors, while their friends might have some anthropomorphic garb (horses, unicorns, and birds are popular animal costuming choices).